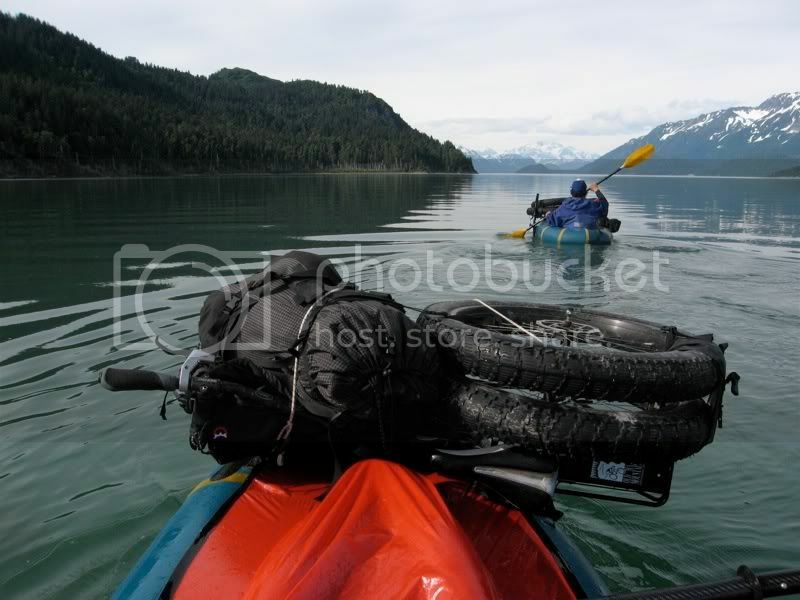 Dylan and I are going to try to go from Yakutat to Cordova on fat tire bikes and packrafts. wow, thank you for providing ever more support for me to quit my job. CST wrote: fun was had.. I look forward to the film! I'm just curious... how many days were you guys out? yep, that's the Hubbard alright. the Gap is just beyond looker's right in that photo, past the small black chunk of land sticking out. Osier Island, which the Gazetteer shows as freestanding in the middle of the Gap, is covered entirely by ice and cannot be seen. we were out 18 days. yeah The Dylan got a good view of it, he would know. Yeah, I know... it's quite a sight! 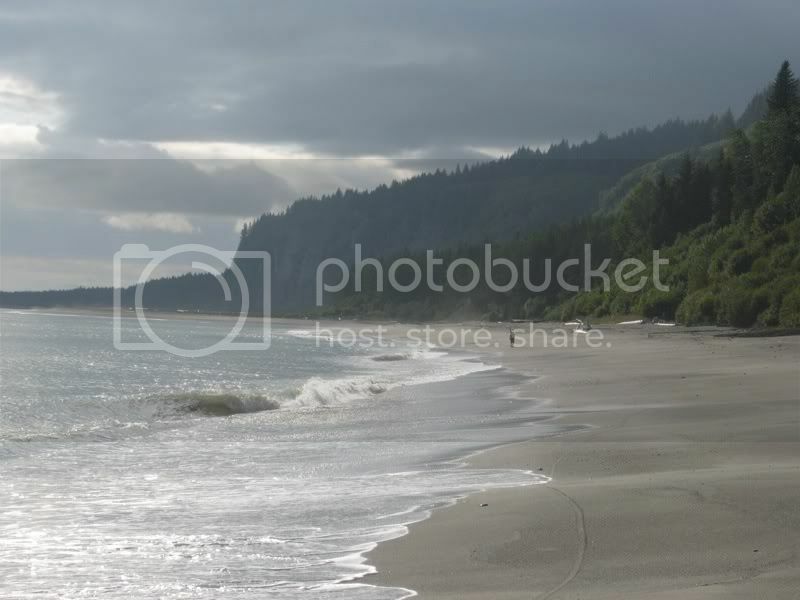 we camped up in at the far corner of that beach in the shot with your tent. What was your route? where did you all go? My trip wasn't as ambitious as your guys'... being solo, that was probably a good thing. where I 'shwacked over the pass down to Russell Fjord. I spent the next 9 days in the fjord and didn't see another soul until day 13, which was kinda cool. 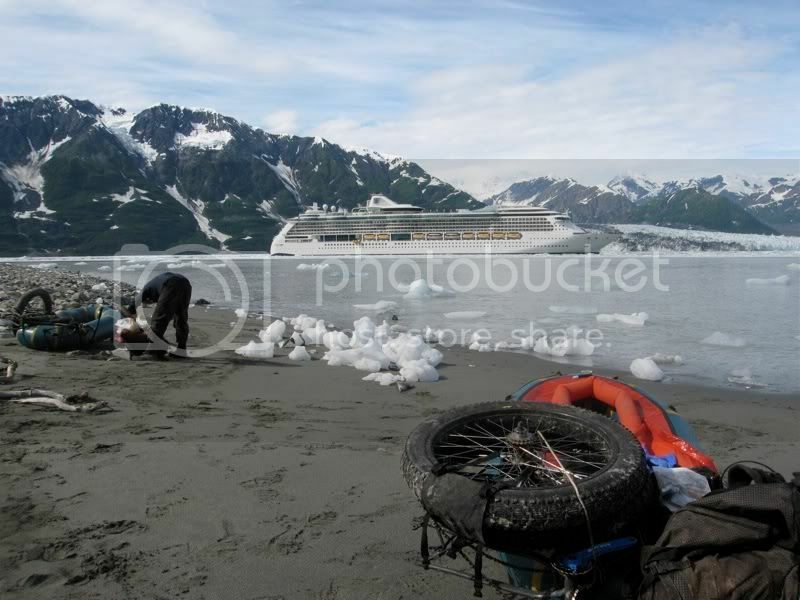 I'd intended to round the Hubbard Gap and head south down the shores back to Yakutat, but the glacier had advanced so close (within a hundred yards... it took only 12 seconds for a wave from a glacier calve to hit the opposite rocks) that I chickened out, and headed back the way I came down the Fjord. The tidal currents were pretty fierce through there. Erin & Hig went through there a few months later, and (thankfully) the glacier had retreated a bit. 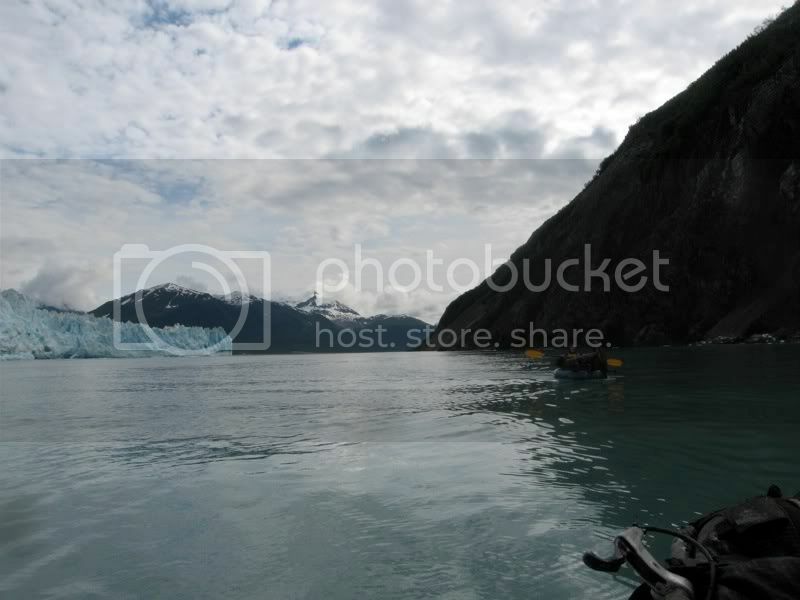 They had a lot more breathing room to get through the gap at the Hubbard Glacier. 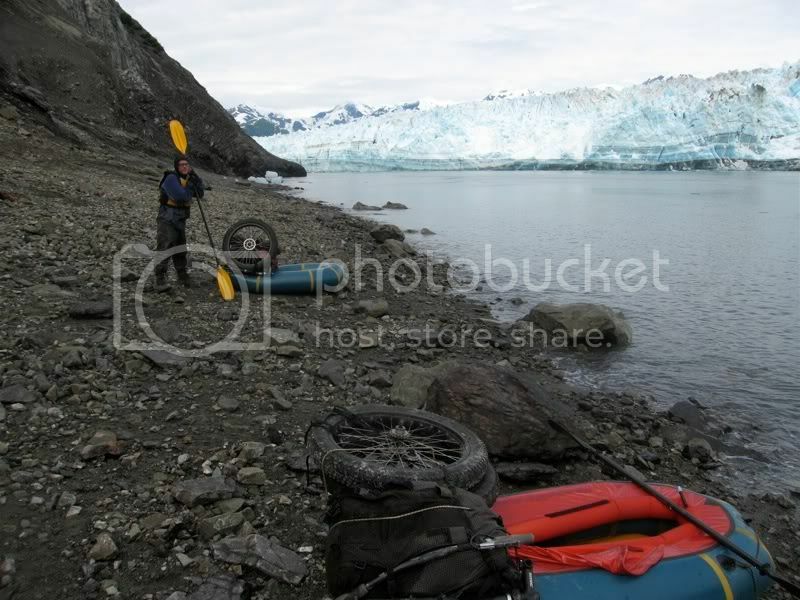 After that I headed back to Situk Lake and floated a couple days down the Situk River from source to sea. 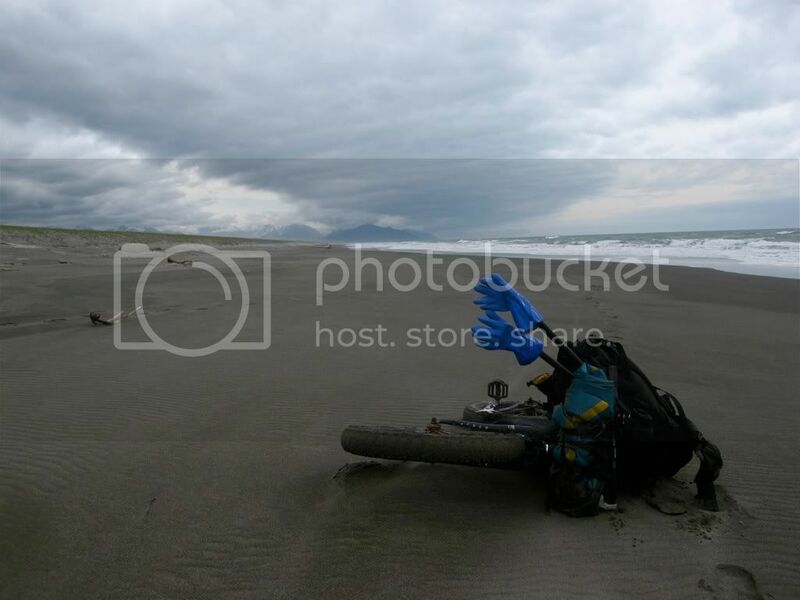 I walked a couple more days along the coast back to Yakutat by day 16. All said, mine was ~125-150 miles (give or take). A leisurely pace, but I enjoyed it. Something like this is definitely on the list for the middle-future. Amazing stuff. 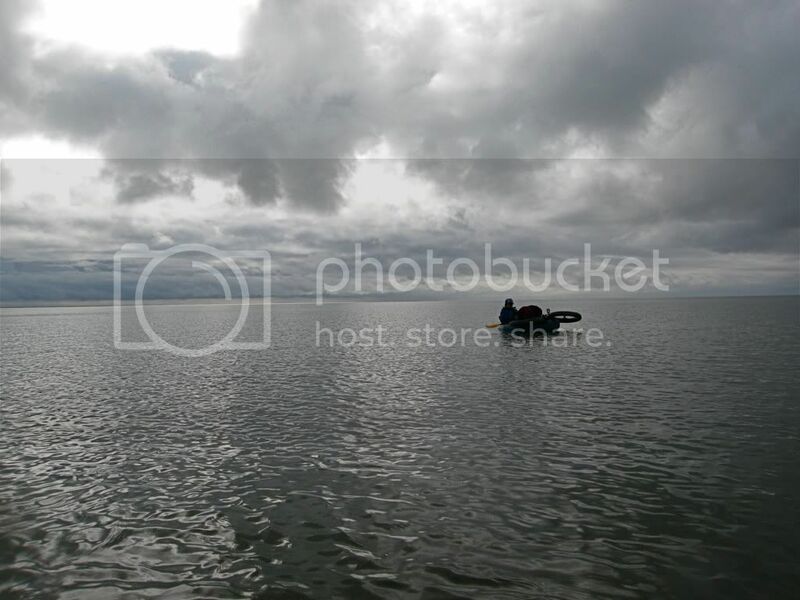 Totally classic shot of the tent in the water! What an awesome solo trip you had. We were terrified of Hubbard gap too, so we tried bushwacking around it but ended up broken & shattered after a day and a half with the bikes, we dropped down a talus gully that thankfully didnt cliff out and then we ran it with serious nerves. It calved twice and the swells were enormous in the gap, add to that reflection waves from the cliff and moving ice it was simply terrifying. never again. We hung out for a few hours on the island around the corner and de-compressed before moving to Mancas point. Very cool. I remember you guys naming that "Terror Gap"... a fitting moniker. 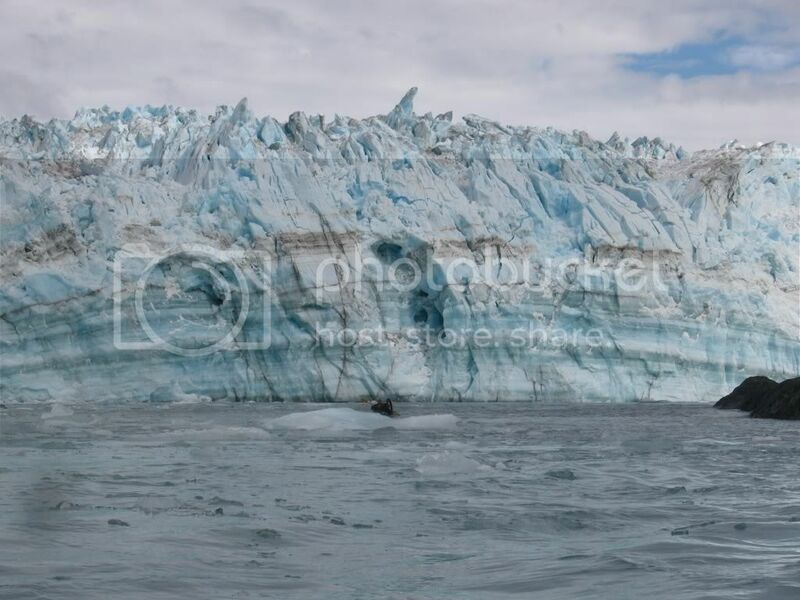 I sat for two days at Gilbert Point, watching the Glacier calve in the channel through a pair of 8x21 binoculars. And you're right... those swells are friggin' huge. I recall in my journal estimating some of the bigger ones being at least 8' as they crashed against the cliffs... and bigger further out in the channel. I might have sucked it up and made a mad dash anyway (maybe) if I hadn't been alone. But with no one else around and a family back home, I opted to just sit back & enjoy it from camp. I can't say I regret that. Those swells tossed icebergs around like pinballs. You guys put a lot more mileage under your tires than I did (I didn't have a bike... neat idea, btw!). I didn't know about your trip until after it was over, but it's a cool report to read. I spent time on a previous trip exploring the woods & glaciers around Cordova the year before, so it's kinda cool to see you guys (and Erin & Hig, for that matter) "connect the dots." Hey Thanks - 8' huh? I have no idea, but they were huge and scary in the boats, just praying that they wouldent start braking on us. Schwack "camp" - the leatherman saw came in very handy! Things were looking good - nice and calm, but right after I took this photo it calved and that was the end of the photo taking for a while. about 30 seconds later we were riding the big ones scared shitless. If you waited 30 seconds for the waves to hit you, you definitely had a lot more breathing room in there than I was looking at the year before. 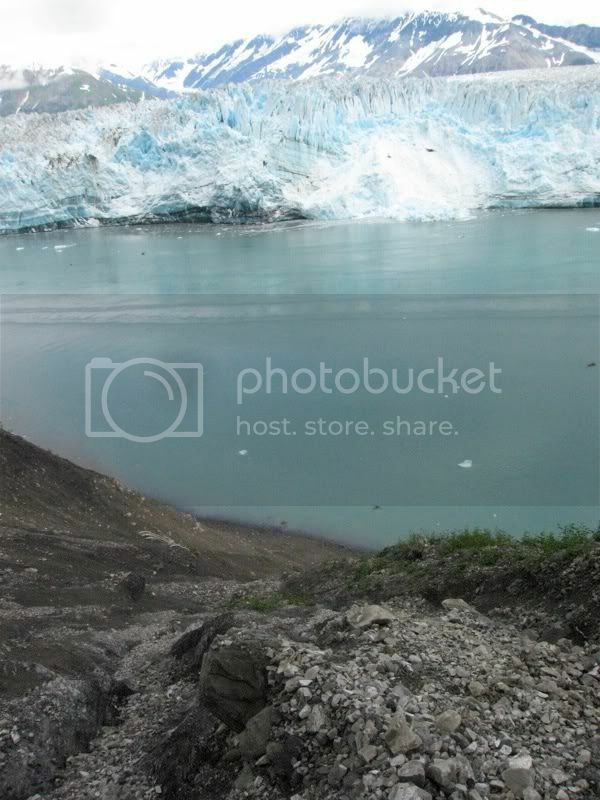 At the time, I clocked it at 12 seconds from the time the glacier calved to when the waves crashed against the cliffs. The pictures you took look like you had a lot more room too. Good! 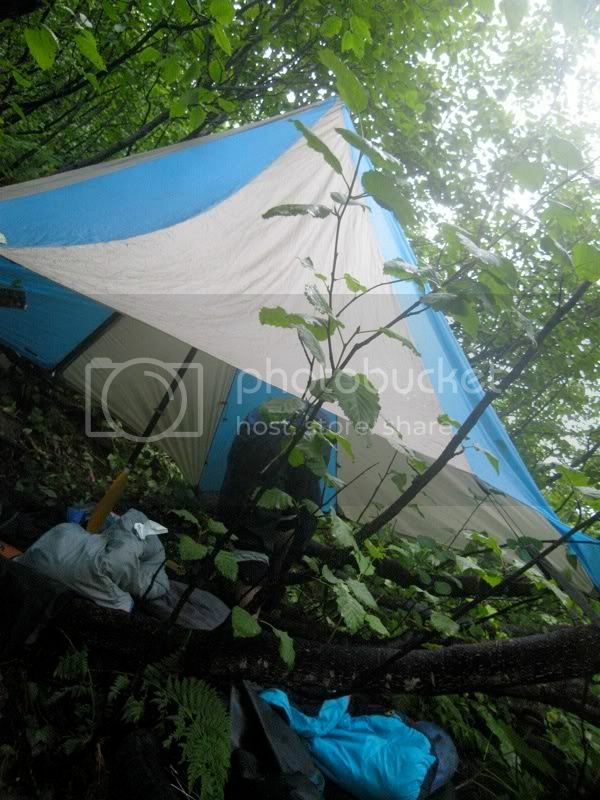 I love the bushwhack camp! I considered trying to 'schwack over the ridgeline as well, but thought better of it from the looks of 3000' of alder thickets and nasty gullies on those hillsides. I'm glad you guys made it through there (at least part of the way) okay! wow 12 seconds, that's crazy. 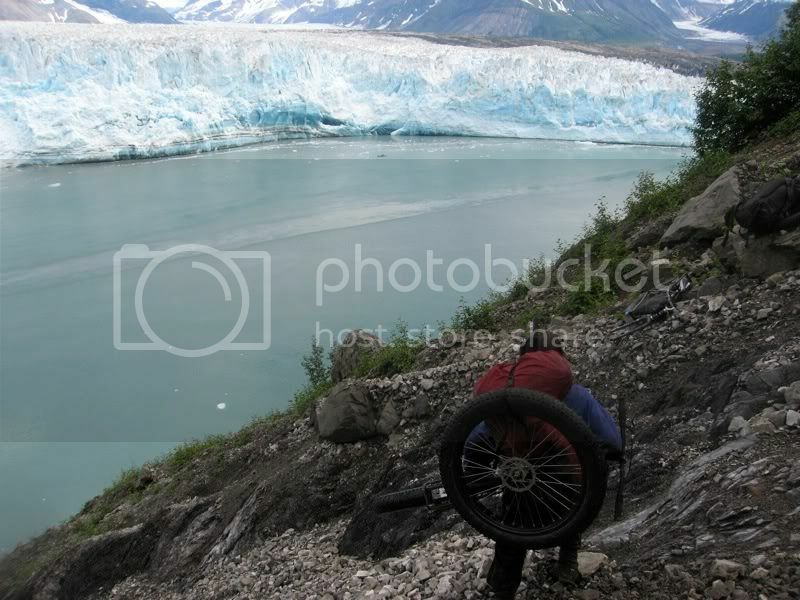 We did have a good ammount of room, but the glacier was still towering above us. The schwack camp was hilarous, we actually slept great in the reclined position (it was like a 30 degree slope) and cutting down the Alders was key. 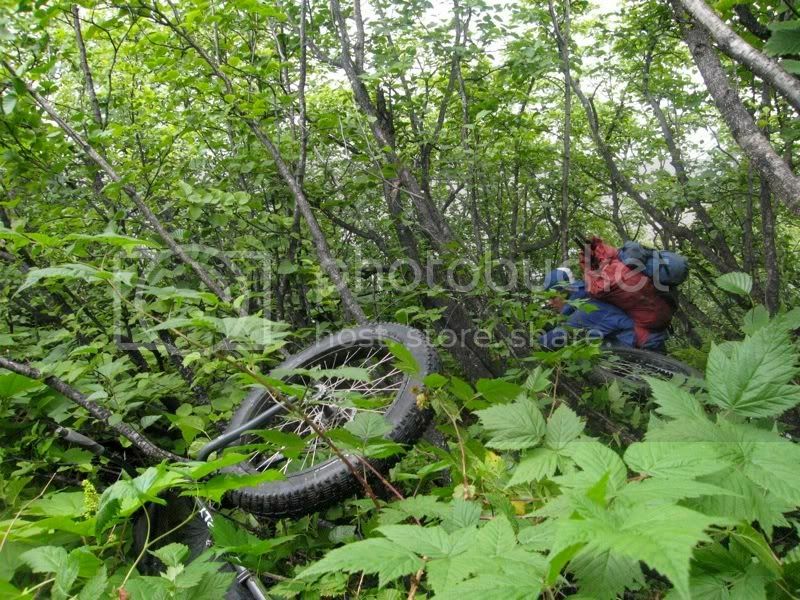 We Estimated it would be a 3 day solid bushwack with bikes, and probabally still 2 without.